Idaho is a natural gem. 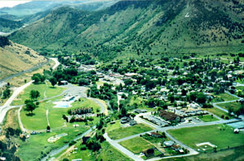 Lava Hot Springs, Idaho is a year-round resort community located in a picturesque mountain setting centered between Salt Lake City, Utah and Yellowstone National Park. Located just minutes from the School House Inn, you will have no problem finding fun in this town! The World-Famous Lava Hot Mineral Springs Bubbling out of natural underground springs, the hot water is laden with Minerals, but has no sulfur and therefore no bad odor. Over 3 million gallons a day course through the springs and are diverted into the Portneuf River keeping the springs ever changing and clean. The spring's temperatures range from approximately 102F to 110F degrees. On cold winter nights, when the steam of the hot springs reduces visibility to a few feet, people of all ages talk and play in perceived anonymity. Map & directions to Lava Hot Springs Click here to print a map and driving directions to Lava Hot Springs. Other Local Things to See & Do! Spend an evening with family and friends while enjoying the cool, refreshing mountain air of the majestic Rocky Mountains! An exciting wagon ride, delicious food, and memories never to be forgotten. For winter fun, we have snowshoe rentals, a beautiful trail, and warming hut. Celebrating 52 years of skiing excellence, Pebble Creek is a vertical playground that attracts extreme skiers but also offers plenty of terrain variety of other skill levels. Located just northwest of Lava Hot Springs, in the Caribou National Forest, Pebble Creek boasts virtually non-existent lift lines. The 50 member PSIA/AASI Member Ski & Snowboard School offers a wide range of group programs as well as private lessons. Our City Park located at 5th & Main contains pavilions with tables, tennis courts, basketball court, baseball diamond, badminton and volleyball net, horseshoe pits, and public restrooms facilities. Perfect for family reunions. Our Downtown Park has portable restrooms, playground and picnic area. It is located between Main Street and US. Highway 30 at eastern edge of Lava Hot Springs, just across the street from the Hot Pools. City Hall (208) 776-5820.